Sitting down to think about what to say about pumpkins, the first thing that popped into my head was the time my dad took me to the record store at the mall for my sixteenth birthday and let me pick out a CD as a present. I chose Siamese Dream by The Smashing Pumpkins, which back then was a cool new album. “Smashing … Pumpkins?” he said slowly. “What the heck kind of a name for a band is that?” No doubt I answered by just rolling my eyes. Fast forward another sixteen years, and instead of buying alternative CDs, I’m buying tickets at my daughter’s school for a pumpkin they’re raffling off as a fundraiser. How times change. Cook the pumpkin or squash in a large saucepan of boiling salted water until tender but not falling apart, about 10 minutes. Drain and cool for 10 minutes. While the pumpkin is still warm, transfer to a food processor or blender and puree until smooth. Stir in the jalapeño and season with salt and pepper. Divide the pumpkin mixture equally among 6 tortillas (about 1/4 cup (60 ml) per tortilla) and spread it evenly across the tortilla. Sprinkle feta over each tortilla. Top each with 1/4 cup (10 g) cilantro and sprinkle with black pepper. Top with the second tortilla. Heat a heavy, large griddle or skillet over a medium‐high heat. Cook the quesadillas until golden and dark char marks appear, about 1 minute per side. Serve with lime wedges. First, make the dressing. Place the chorizo in a small skillet and set over a medium heat. Cook, stirring and breaking up clumps, until the sausage is browned and cooked through, 8 to 10 minutes. Add the garlic and stir for 1 minute, then remove from the heat. Transfer the chorizo and garlic into a screw‐top jar. Add the oil, vinegar and oregano, secure the lid and shake until smooth. Taste and season with salt if you think it needs it (Rick Bayless recommends 1/2 teaspoon). Refrigerate until ready to use. Shake well immediately before dressing a salad. If you want to use this as a warm dressing (as is common for spinach salad), microwave uncovered for 15 to 20 seconds, secure the lid and shake again. To make the salad, pour about 2 quarts (2 liters) of water into a large pot and set over a high heat. Add the salt. When the water boils, add in the lentils and rice. Reduce the heat slightly, but keep the water at a brisk boil and cook until the lentils and rice are tender (no chalkiness inside) but show no signs of falling apart, about 15 minutes. Pour into a strainer set in the sink to drain completely. 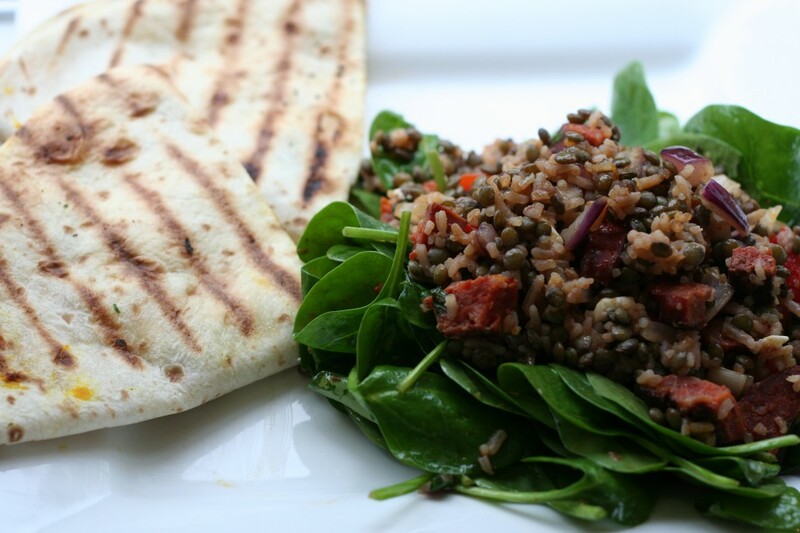 Scoop the lentil‐rice mixture into a very large bowl, along with the red onion. Pour in about 1/4 cup (60 ml) of the dressing and mix well. Add the chopped chorizo or ham and red pepper to the lentils and toss to combine. Season to taste. Scoop the spinach into a large bowl. Shake the dressing throughly to blend, then drizzle on about 3 tablespoons and toss to combine. (Save the rest of the dressing for another salad.) Divide the salad among 4 plates, roughly forming it into nests. Scoop a portion of the lentil salad into the center of each and serve.